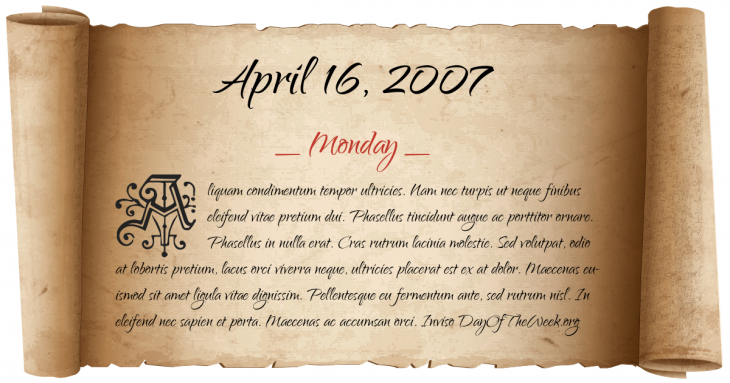 April 16, 2007 was the 106th day of the year 2007 in the Gregorian calendar. There were 259 days remaining until the end of the year. The day of the week was Monday. A person born on this day will be 12 years old today. If that same person saved a Half dollar every day starting at age 3, then by now that person has accumulated $1,645.50 today. Here’s the April 2007 calendar. You can also browse the full year monthly 2007 calendar. President of Côte d'Ivoire Laurent Gbagbo declares the First Ivorian Civil War to be over. Virginia Tech massacre: The deadliest spree killing in modern American history. Seung-Hui Cho, kills 32 and injures 23 before committing suicide.